In 1972, Allan Spear seized the opportunity to run for the state Senate after coming out as a homosexual to his family and close friends. However, he was faced with the dilemma of reconciling his new gay identity with a tough legislative race. At that point in time, no openly gay person had ever served in elective office anywhere in the United States. To protect his chances of winning, Spear decided not to run as an openly gay candidate, but to include gay issues on his platform. ​I want to do everything I can to support this movement so that other people aren't going to have to go through twenty years in limbo without revealing themselves even to those whom they love the most. 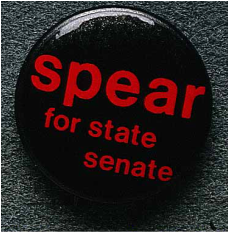 At the end of the election, Spear beat his opponent by one thousand votes, and the DFL had won control of both houses in the Minnesota legislature, a momentous event in Minnesota political history. Although he had not come out yet, winning the the state Senate seat was considered a gay victory. In just four years, Spear went from being a political novice to winning a seat in the state Senate all while balancing a difficult political campaign with the stress of coming out as a gay man.